Question: I want to add a family room addition to my tiny house. My square footage as of now is 544 sq feet on the first floor and 544 sq on the second floor. There is no full attic, nor a full basement. As you can see it is a small home. I want a one level 16×25 family room addition with a crawl space. My question is, do you think that is a good size or is it too big? Answer: Indeed your house is small; however adding a family room addition to it is possible. I think the 16×25 family room addition, simply added to the side of the home may be a bit excessive such that it throws the home out of balance. 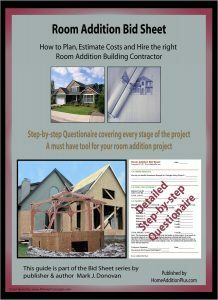 The addition may swamp the size of the main home from a proportions standpoint when viewing it from the curb. One architectural possibility is to consider some form of a “wrap-around” family room addition, where you have a portion of the family room extended off the side of the house and the remainder of it, extended off of the back of the home. I would suggest your contact a local architect, as he/she may be able to provide a number of family room addition ideas that creates a finished home with curb appeal. Curb appeal is important from a resale perspective. Future home buyers care for both space and how the home looks, both from the inside and the outside.